Earlier this year, Microsoft announced that every major new Xbox One exclusive will be available to download and play from launch day via the Xbox Game Pass, which means the prospect of a real ‘Netflix for video games’ service comes one step closer to becoming a reality. State of Decay 2 is the latest big exclusive making good on Microsoft’s promise, which probably has many of you wondering whether it might be worth subscribing to the Game Pass just to get in on the zombie slaying action. But Microsoft’s service has been around for almost a year now and, even when you ignore its recent announcement regarding those upcoming exclusives, there’s still good reason for signing up now to enjoy what’s already available. There’s so many games available with the Pass, in fact, that it can be quite the effort to wade through everything on offer to find the gems hidden amongst the heapings of shovelware. Well you need wade no more, as I’ve done the hard work for you and put together a selection of the best games available on Xbox Game Pass right now, featuring an eclectic mix of indie gems, golden oldies, and triple-A blockbusters to make sure there’s something for everyone. With the following games instantly available for $9.99/£7.99 a month, you really can’t go wrong. No need to rub your eyes; you read that header right. As of December 2017, in which Gears of War 4 was added to the collection, every instalment in Microsoft’s genre defining third-person shooter franchise is now available via Xbox Game Pass. That includes the original Gears of War (still great, but showing its age a little), Gears of War 2 (a more polished follow up to the original), Gears of War 3 (the one with the surprisingly touching story), Gears of War: Judgement (not as bad as people say it is), and Gears of War 4 (The Coalition’s impressive next-gen reboot from 2016). Granted, that’s a lot of Gears to get through but, with each campaign segmented into a series of hour-long bitesize chunks, this is about as close to Netflix-style video game binging as you can get right now, and there’s no better a series to do it with. Remember that time Insomniac Games made an Xbox One exclusive? I’d imagine not many people do, as Sunset Overdrive sold pretty poorly despite rave reviews, largely overlooked before being completely forgotten about once GTA 5 and The Master Chief Collection hit the Xbox One only a few weeks later. But there’s still time to cash in on this unappreciated gem, and you really should... presuming you can put up with all of its bad jokes. Insomniac imbues a dynamic sense of flow into open world traversal that’ll make you super excited for what’s in store for its upcoming Spider-Man game, while Sunset Overdrive’s visuals quite literally pop and crackle across the screen like a comic book come to life. You might not feel compelled to see the story through to the end, but hey, that’s what the Xbox Game Pass is there for. Play, enjoy, and move on without having paid so much as an extra cent. Trust me when I say that you will definitely appreciate the craftsmanship of the BioShock universe that little bit more if you play each installment in consecutive order, preferably without interruptions between them to keep you keenly engaged with its deftly interlinked story. The Game Pass provides the perfect opportunity to do so, with Bioshock, Bioshock 2, and Bioshock Infinite all available as of right now. Though debate still rages as to which is the best one (most people agree that it isn’t Infinite), all of them are worth playing through from start to end for their immersive storytelling, emergent combat, and breathtaking settings. Now would you kindly go and download all three of these games right this instant, thank you very much? Better than Dead Rising 4 but not as good as the rest, Dead Rising 3 is a safe bet for zombie hunters looking for some frivolous open-world shlock to hop into. Don’t play it for its hokey and forgettable story, but instead dip into Dead Rising 3 whenever you want some mindless, delightfully excessive popcorn entertainment, as Capcom goes all out with the (then) new hardware to offer more elaborate weaponry, over-the-top chaos, and hundreds upon hundreds of zombies. Sure, it looks and feels like an Xbox One launch title from 2013, complete with Microsoft Smartglass integration (ha! ), but there’s still fun to be had from this rough and wonky gore-fest. In an alternate dimension, a different version of myself is probably looking back fondly on Halo 5: Guardians right now, praising it as the beginning of an exciting new era for the franchise and a worthwhile addition for any Xbox One collection. Sadly, I can do no such thing; Halo 5 is probably one of the worst Halo games out there, but - when you consider the calibre of the series up till now - that doesn’t necessarily make it a throwaway game experience. The campaign caters to four player co-op, which is great if you know four other people but a bit boring if you don’t, while certain modes on multiplayer are still populated by other Spartans to this day, and the servers are nowhere near as unstable as they used to be. In summation, this is one for the Halo fans, but if you’re looking for some decent FPS action, you could do a lot worse than this. A remaster of a last-gen reboot isn’t exactly the poster child to sell you on the Xbox Game Pass, but when that remaster of a last-gen reboot is DmC Devil May Cry: Definitive Edition… well, now we’re getting somewhere. Capcom finally caved in to all those fan demands and gave Dante his iconic snow white hair back with the Definitive Edition, but that’s far from the only reason to give this slick hack and slash a shot. The fighting is thick and fast, operating at a breakneck pace in tandem with the ever evolving spectacle and irreverent tone, and there’s even a reasonably crowd pleasing story to get invested in too. Capcom’s remastered visuals are a neat bonus, but it’s the juicy, jocular combat that’ll keep you coming back. Having mastered the art of bombast with the Just Cause series, Avalanche Studios dials down the silliness but not the scale for the apocalyptic deserts of Australia in its Mad Max video game adaptation. It’s rough around the edges in parts, falling into the same pit traps that many open world games have been plagued by in recent years (the game’s obsession with busywork is a page ripped straight out of Ubisoft’s playbook), but Mad Max certainly looks and plays the part. The driving is as gloriously reckless as you remember from the movies, while Max’s Arkham-lite combat style feels punchy and downright frenzied at times. It’s not easy to make the desert look interesting, but Avalanche brings the sandy expanse to life, as you explore a world troubled by storms, bandits, and all manner of unexpected dangers. Microsoft Studio’s surprise sequel to the cult classic, Halo-themed RTS only released last year, but you can digitally own it for as long as you want with the Game Pass, as another Xbox One exclusive readily available through the subscription service. And download it you should; Halo Wars 2 is more accessible than most RTS games, but that makes the controller experience - usually a finicky exercise in finger management - a surprisingly intuitive one. Playing online is a blast, too, but the AI is competent enough to ensure that you can face a worthy opponent even if you’re not hooked up to Xbox Live. No, Minecraft is not available on the Xbox Game Pass, at least at the time of writing, but that doesn’t matter. For many people, Terraria isn’t just the next best thing to Mojang’s cultural sensation, it’s better. A 16 bit platformer with a distinct survival-crafting focus, Terraria takes the Minecraft formula and blows it out of proportion into something that more closely resembles a full on RPG than anything else. There is so much stuff to see, do, and craft in Re-Logic’s indie hit that you could easily rack up hundreds of hours delving its mines, building immense fortresses, and taking on the game’s selection of well designed boss fights. Terraria supports up to eight player co-op online too, which is definitely the best way to play it if you’ve managed to share the good news of the Game Pass with friends. Rumours of a new Fable game in the works are currently doing the rounds, but the closest thing to playing Fable on Xbox One right now is Fable 3, which is backwards compatible and playable through the Game Pass. If you’ve played the game, you’ll already know it’s worth a replay, and if you haven’t, then this is a great way to see what all the fuss is about. The definition of a unappreciated masterpiece, not enough people have played Last Light, and that needs to change now that 4A Games’ next-gen sequel Metro Exodus is on the way. As a thoroughly depressing excursion to irradiated Russia, the Metro series has always liked to do things differently next to other first person shooters, and Last Light is no exception. You’ll be surviving as much as shooting, where bullets are so scarce that they can be used to buy items as the official currency in the underground bunkers beneath nuclear Moscow. The deformed beasts and aliens that roam each level are not going to be kind to you, but it’s the tense political backdrop and hard-hitting story which will stay with you more than anything once you’ve put the controller down. A must-get for any Game Pass subscriber. Jonathan Blow’s indie classic Braid celebrates its 10th birthday this year, and still holds up as a deviously clever and dazzlingly fresh gameplay experience, taking a core idea - manipulation of time - and fleshing it out as the basis for a fountain of unique platforming joy. The airtight controls are just as easy to learn and hard to master as they used to be, and you’ll find deep satisfaction in solving the neatly designed puzzles, even if you had already completed the game when it first came out all those years ago. What’s more, it takes up next to nothing on your Xbox One’s hard drive, so you can download it from the Game Pass store and keep it comfortably in your collection for as long as your subscription lasts. It might be light in content, but Sea of Thieves makes up for its bare skull and bones foundation with a hearty atmosphere, sublime imagery, and a sense of jolly pirating adventure that you're not going to find in many other titles. As Rare's first proper game in ages, Sea of Thieves is totally awash in high-spirited joviality and dynamic panache, and you can really tell the entire team must have had a blast making something this inherently joyful. 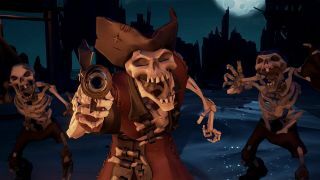 The fact is that the Game Pass is the best way to play Sea of Thieves, as the game remains light on actual things to do, meaning you'll have seen and done everything on the high seas within two weeks, but may want to come back later on in the years ahead when Rare adds new content or another friend joins the crew. As a purist pirating experience, though, Sea of Thieves is hard to beat. Before you jump into Sea of Thieves, Rare’s first proper game since Perfect Dark Zero, why not travel back in time to understand why the studio is so beloved in the first place? Still a touchstone for modern platformers today, Banjo-Kazooie is a masterclass of its era, so smart in its design and buoyant in its personality that the bear-bird duo were at one point dangerously close to toppling Mario from his throne. Since then, Banjo-Kazooie hasn’t seen much of the spotlight (other than that poorly conceived racing game), but their legacy still lives on in the platforming genre today, as evidenced by the clear appetite for games like Yooka-Laylee. Seeing how the Crash Bandicoot N.Sane Trilogy sold so well last year, too, we can only hope that Banjo will get his own comeback in the near future.